According to EIA’s recently released Short-Term Energy Outlook (STEO) estimates, energy-related CO2 emissions increased by 2.8% in 2018 but will decrease in 2019 and 2020. The 2018 increase is the largest in energy-related CO2 emissions since 2010. Although emissions from petroleum – primarily used in the transportation sector – account for the largest share of total energy-related CO2, emissions from natural gas, which increased by nearly 10%, drove the overall increase in 2018. Weather conditions and continued economic growth were the primary factors in increasing energy consumption and emissions in 2018. Based on preliminary data, total US energy consumption in 2018 will be just 0.4% below the record set in 2007. Relatively high energy consumption is attributable largely to changes in the weather: last year was very warm, and US population-weighted cooling degree days (CDD, an indicator of air-conditioning demand) hit a new record in 2018. The winter months of 2018 were also colder than the previous ten-year average, and heating degree days (HDD, an indicator of heating demand) were the highest since 2014. These temperature patterns led to what EIA estimates were record levels of electricity consumption and natural gas consumption in 2018. Electricity is used to meet virtually all air conditioning demand, and natural gas and electricity are the two most common heating fuels. 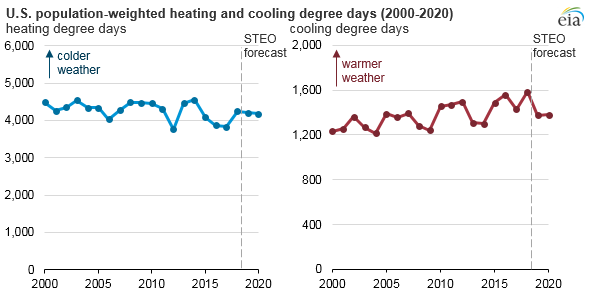 Both 2019 and 2020 are expected to have milder weather than 2018, resulting in fewer HDDs (milder winters) and fewer CDDs (milder summers) and, consequently, less energy consumption. 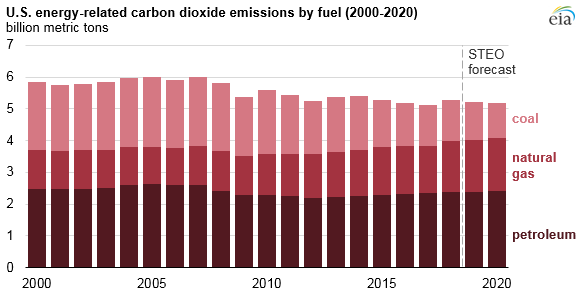 However, even with declines in emissions over the next two years, energy-related CO2 emissions in 2019 and 2020 are still projected to be higher than 2017 levels. Economic factors also affect energy consumption and emissions. Gross domestic product (GDP) growth slows in EIA’s short-term outlook, from 2.9% growth in 2018 to 2.7% in 2019 and 2.0% in 2020. EIA used the December 2018 version of the IHS Markit macroeconomic model with EIA's energy price forecasts as model inputs to develop the economic forecasts in STEO. EIA estimates industrial production growth to have been a percentage point higher than GDP growth in 2018. Industrial production is expected to grow faster than GDP in 2019 but slower than GDP in 2020. The effect of industrial growth on emissions in 2019 is more than offset by a forecast return to more normal weather. Slower growth in industrial production in 2020 would reduce the energy and carbon intensity associated with GDP growth, as industrial production tends to be more energy intensive than other parts of the economy.